In this article we discuss yet another trading strategy used by binary options traders. This strategy, like many strategies we have already discussed, is very reliable and highly accurate, especially for professional binary options traders. However, even if this strategy is mastered by expert traders, the concepts are pretty basic for novice binary options traders to understand. This makes the Pinocchio strategy very appropriate in some conditions when trading binary options. This strategy is called the Pinocchio strategy. More completely, it is the Pinocchio Binary Options Trading Strategy, and is also more commonly known as the Pin Bar strategy. We’ll see why in a bit. This strategy is a well-known and widely-used strategy for traders who are experienced in the market analysis and other related technical research. There is zero probability of false breaks when using the Pinocchio strategy. Carlo Collodi, author of the 19th century adventure book where the strategy gets its name from, may have never thought that a binary options trading strategy will be named after his wooden, puppet main character. But the Pinocchio strategy is aptly named after the fictional character. Remember how this wooden doll who wants to be a real boy grows his nose whenever he lies? It is the same case with this strategy. Seeing a “Pinocchio” configuration in a candlestick formation found in any stock chart means we are trying to look at lie. Let’s try to see why. A Pinocchio bar is also known as a Pin bar. Try to remember the individual candlestick formations that we have discussed in an earlier article and you will recall that a pin bar candlestick has a very small, close to having no body and a long shadow. We also know that a pin bar denotes that an asset’s price opened, rose and fell during the trade period, then eventually closed very near if not exactly at the price level at which it opened. Now let us relate Pinocchio’s nose becoming longer every time he told a lie to what happens with a Pin bar. 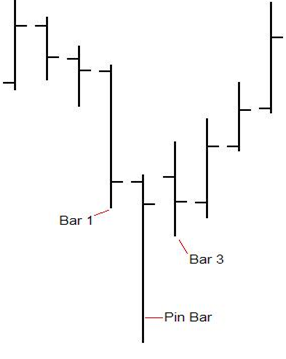 As the trade period progresses, the shadow of a pin bar becomes longer as the price of the asset goes in a certain direction before it actually retraces and closes near where it opened. The longer the shadow, the higher the probability that the price of the underlying asset will go the opposite way and that the initial direction was a lie. Simply put, if there is a long upward shadow, we can analogize it with Pinocchio’s nose and say that the configuration is telling us a lie that the price will be going up in the next few periods. The price will actually be going down. Conversely, if there is a long downward shadow, Pinocchio’s nose is lying to us about a continued downward trend because this is really an indication that the asset price is looking good and is expected to go up. The Pinocchio binary options strategy is based on the combination of three consecutive bars, usually with the pin bar in the middle of the other two. These bars that can be configured in two different ways. A Bullish Pinocchio configuration is made of three consecutive bars with the pin bar showing a long downward shadow. This usually indicates a bullish trend. When this is seen, binary options traders are ready to look at a reversal from bearish to bullish. Conversely, a Bearish Pinocchio configuration is made of three consecutive bars with the pin bar showing a long upward shadow, indicating an imminent downtrend. Binary options traders make the appropriate purchases to rally this expected change in trend. To be more specific, the strategy involves purchasing a PUT option if we see the shadow is up and a CALL option if the shadow is up. The entry point varies as some traders prefer to wait for the next candle to retrace to the 50% Fibonacci level of the Pin bar and others just enter immediately after the Pin bar closes. Knowing the background of this strategy, it can be considered as a price reversal method. The logic is that the direction of a high bar shows the opposite of the price movement in the market, since a Pinocchio bar is lying to us. To perform the Pinocchio Binary Options Trading Strategy, you should be able to decide on the underlying asset that you are willing to trade on. Using a reputable binary options broker and a reliable charting platform, set your tools to look at candlestick formations for your specific trade periods and other necessary requirements to make a pin bar trade. This may include configuring your settings to make the candles visible in the time period selected. The next step would be to observe the bar formations. 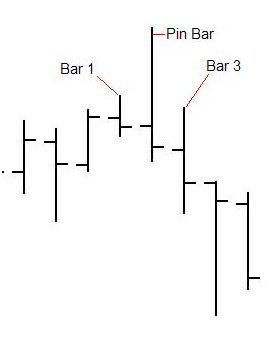 What you are searching for is 3 consecutive bar formations; the middle one should be higher than other two. These can be upward and downward direction. While there could be a number of these kinds of formations, the best move would be to enter in the one which is 50 percent higher than the low bars around it, and opens or closes at one end. Finally, look into the pin bars. If the nose is high, it reflects the low price; so you need to enter a PUT option. Otherwise, if Pinocchio’s nose is low, then you enter a CALL option. There are certain limitations to the Pinocchio strategy. The first and foremost is that it is not for everyone. Experienced traders can take better advantage of this strategy and can make consistent profit. But that does not mean novices cannot master this strategy. Consistent observation of stock charts and being on the constant lookout for these formations can train a trader to master this technique. Another big drawback of this strategy is that it requires a large stop loss. If you come close to it, then saving yourself from suffering a loss is very improbable. One of the most important things that you need to take extra care with when trading using Pinocchio is to never to trade in a single bar. Always look for the 3-bar combination. Lastly, if you earn profits on a trade, it would be wise not put the whole amount in the process again as you may tend to lose significantly if the next formation does not go your way. Learn more trading strategies by keeping glued to our site. We also feature a list of top binary options brokers to get you started.